This adidas Ultra Boost Uncaged Tan colorway is an upcoming adidas Ultra Boost that will be releasing in Spring 2017. Featuring a Tan-based upper that’s built with adidas’ Primeknit construction that includes a matching Tan heel counter. 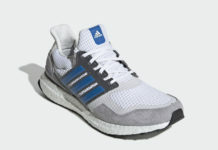 Completing the look is a Solar Red colored Boost midsole and Cream-like Continental rubber outsole. Look for the adidas Ultra Boost Uncaged “Trace Cargo” to release on December 2nd, 2016 at select adidas Originals retail stores. The retail price tag is set at $180 USD. UPDATE: adidas releases official images of this upcoming adidas Ultra Boost Uncaged in Tan and Solar Red. UPDATE: Here’s a closer look at the “Tan” adidas Ultra Boost Uncaged for 2017 via @sneakerprophet_.